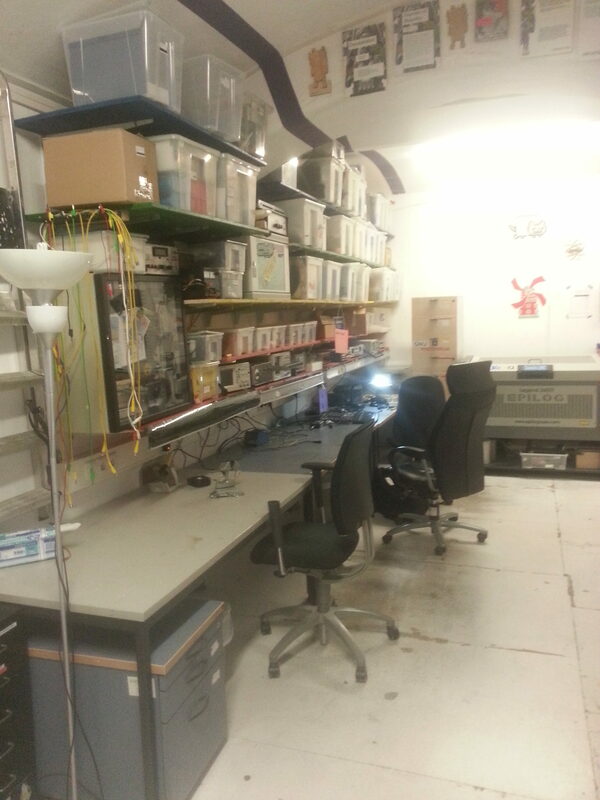 Metalab is one of the oldest hackerspaces in Europe. Its workshop in the center of Vienna – in between the Austrian Parliament and Vienna’s Rathaus (city hall) – has been open since 2006. The entrance to Metalab on Rathausstraße. It got started when a few friends wanted somewhere to meet and exchange ideas, and to get access to machines that they couldn’t afford to have at home. 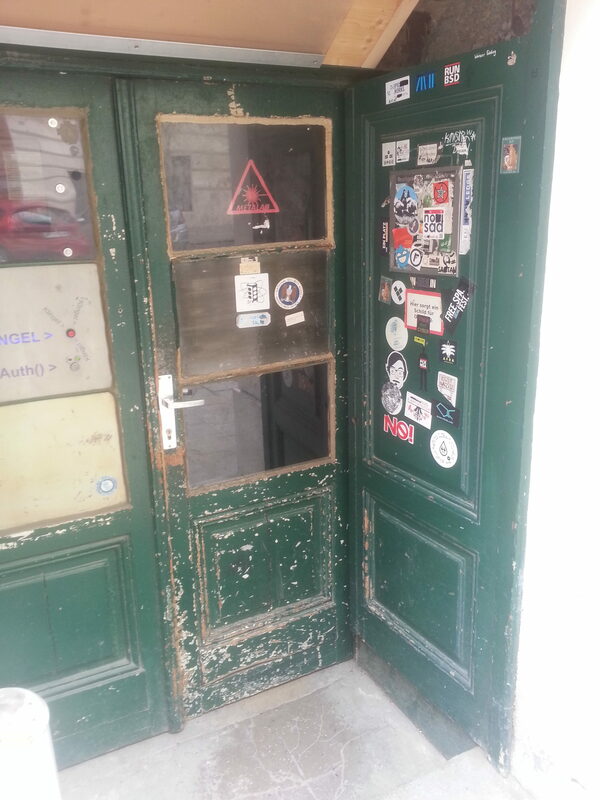 They started meeting regularly in pubs before receiving a grant to set up a physical hackerspace as part of a city funding project to support Vienna’s internet culture scene. Some of the original members were involved with the Chaos Computer Club hacker organisation, and Metalab was one of the hackerspaces visited by a delegation of American hackers after the 2007 Chaos Communication Camp that led to the first hackerspaces being set up in the USA. Metalab’s electronics and laser cutting workshop. Over the past 11 years Metalab has expanded to include a huge main hangout / work space, a breakout space called the Library, a 3D printing room, an electronics workshop, a machines workshop, and a darkroom – plus a chill out room for pizza and gaming. Although they take an “anything goes” approach to activities, most projects are coding or electronics focused. Projects dotted around the space include a VoIP phonebox that they’ve taken to other CC Camps, an arcade machine emulator in the chill out room, and a huge LED wall separating the main space from the Library. The kitchen fridge is full of Club Mate, and one of the bathrooms has a hi-tech toilet they shipped over from Japan. 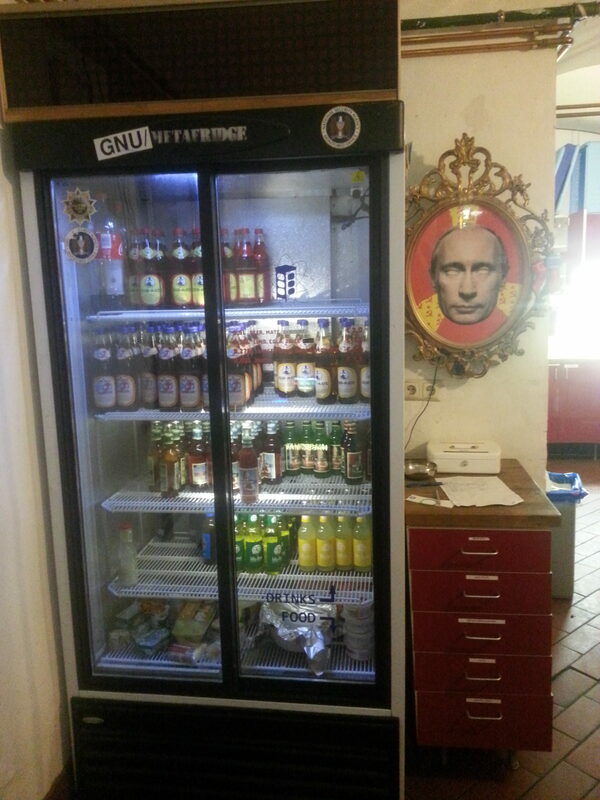 Hackers love Club Mate, though they’re not so keen on Russian presidents. Metalab has events on most evenings, including local tech user group meetups, workshops, and talks. The events are all open to the public and anyone can visit whenever the space is open, too: turn up and ask for a tour, or just hang out. The monthly Metaday events are a good time to visit and chat to people, and to hear talks on a variety of topics. 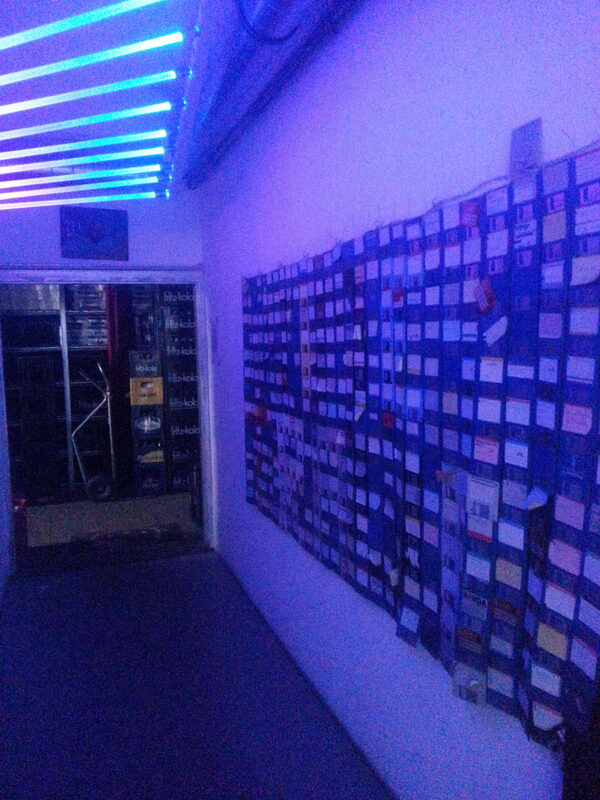 Floppy disk artwork in Metalab’s entry corridor. You don’t need to be a member to visit or use the hackerspace but they’re funded via membership subscriptions so if you’re going to be going along regularly it’s good to sign up 🙂 Memberships cost €20 per month with concessions available on a case by case basis. If you’re interested in joining then turn up to an event or when someone’s likely to be there, which is most evenings and weekends, and speak to someone about becoming a member.